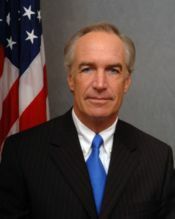 Dirk Kempthorne, a former governor of Idaho, is the Secretary of the U.S. Department of the Interior. President George W. Bush originally nominated Kempthorne on March 16, 2006. Bush, "selecting a pro-development Western Republican to push for more oil and gas drilling" , "urged the Senate to move quickly on his nomination." Lynn Scarlett, Norton's deputy, was to serve in the interim. "Environmentalists, who are not enthusiastic about Norton's record, are unlikely to be enthusiastic about Kempthorne. In 2003, when Kempthorne was tipped as a possible head" of the Environmental Protection Agency, "liberal columnist Timothy Noah wrote in Slate that he would be a 'comically anti-environmental choice'," UPI reported March 17, 2006. "Lawson LeGate, southwest representative of the Sierra Club, said Kempthorne had a record of not supporting protections for public lands: He supported drilling in the Arctic National Wildlife Refuge, opposed the Clinton-era roadless rule, and weakened the endangered species and water protections. In 2001, Kempthorne received from the American Legislative Exchange Council (ALEC) the Thomas Jefferson Freedom Award, its highest honor. In July 2003, UPI reported that a Knight-Ridder "analysis of Kempthorne's record [on the environment] in his four-and-a-half years as governor showed he [had] cut the state budget three times and sharply reduced enforcement. It claimed he allowed the air to get dirtier, waters to become more polluted and more toxins to escape into the environment." As a U.S. Senator, "Kempthorne repeatedly earned low rankings on environmental scorecards, especially after he supported placing an Air Force bombing range in the breathtaking Owyhee Canyonlands. (It was later scaled down markedly by the courts.) As governor, he went to court to keep grizzly bears out of his state, trimmed environmental services budgets and enthusiastically backed the Bush administration's loosening of road-less protections in national forests," according to a March 17, 2006, Los Angeles Times editorial. "In his six years in the Senate, Kempthorne championed a rewrite to the Endangered Species Act that was criticized by some environmental groups, but won the backing of key Democrats, including the current Senate Minority Leader Harry Reid, D-Nev. The bill did not pass the House. ... Kempthorne also helped pass amendments to the Safe Drinking Water Act," Robert Gehrke wrote in the March 17, 2006, Salt Lake Tribune. "As governor, he opposed the Interior Department's decision in 2000 to reintroduce Grizzly Bears into the Bitterroot Range and recently the state said it would shoot wolves to control populations, after a deal with Interior that grants the state management of the packs," Gehrke wrote. "Idaho's governor, Republican Dirk Kempthorne, helped finance his re-election by receiving about $86,000 â?? about 8 cents of each dollar â?? from timber, mining and energy industries that could benefit from greater access to national forests in his state," USA Today's Tom Kenworthy reported July 24, 2005. "Two of Kempthorne's top three donors for the 2002 campaign were the Coeur D'Alene Mines Corp., which gave $13,922, and the Potlatch Corp., a forest products company, which gave $12,034, according to the non-partisan Institute on Money in State Politics," Kenworthy wrote. According to his White House nomination, "Governor Kempthorne has served as Idaho's Chief Executive since 1999. As a two-term Governor, he has served as Chairman of the National Governors Association, Chairman of the Western Governors Association, and President of the Council of State Governments. Governor Kempthorne was also a member of the Columbia River Basin Forum, which established a regional plan to save wild salmon in the northwest. "Prior to serving as Idaho's Chief Executive, Governor Kempthorne was a member of the United States Senate. During that time, he served as Chairman of the Senate Subcommittee on Drinking Water, Fisheries and Wildlife. He also served as Chairman of the Senate Armed Services Subcommittee on Personnel. "Endangered Species Conservation Act of 1995" (S. 1364). Wikipedia also has an article on Dirk Kempthorne. This article may use content from the Wikipedia article under the terms of the GFDL. Official Website of the Governor of the State of Idaho; Biography: Dirk Kempthorne. Dirk Kempthorne in the Wikipedia. Dirk Kempthorne On the Issues; on the Environment. Campaign Finance Money: Dirk Kempthorne, Open Secrets. "Oil Industry Money Moves Senate on Arctic Refuge. Arctic Refuge Drilling Supporters Receive Four Times More than Opponents," U.S. Public Interest Research Group, Public Citizen Sierra Club, and Northern Alaska Environmental Center, Undated. "Endangered Species Act," Ecological Society of America Environmental Policy Update, October 30, 1995. "Marine Wildlife Threatened by Anti-ESA Bill in U.S. Senate," Center for Marine Conservation (turtles.org), February 1996. Scroll down to article. Statement of Senator Dirk Kempthorne, Hearing Before the Environment and Public Works Committee, Proposed NAAQS for Ozone and Particulate Matter, February 12, 1997. Statement of Senator Dirk Kempthorne, US Senate Committee on Environment and Public Works Hearing on Global Climate Change, July 17, 1997. "Legislation Introduced to Weaken Endangered Species Protection," Sierra Activist (Garden State EnviroNet), September 1997. Scroll down to article. "Bush Administration Continues Attacks on Environment. National Forest Roadless Policy in Peril; Government Delays Implementation Even Longer," National Resources Defense Council, March 16, 2001. "Forest Protections," PBS Online NewsHour, May 7, 2001: "A ban on new roads in federal forests has drawn opposition from state and local officials, as well as the logging industry. Following a background report, Margaret Warner speaks with the governor of Idaho and a former Clinton administration official." Timothy Egan, "Norton Charts a Different Course for the Interior Department," New York Times (Earth Share News), August 20, 2001. "Kempthorne: Time to Delist Wolves. Governor directs Office of Species Conservation to help federal agency with process," State of Idaho, October 1, 2001. "The Top Ten Conservative Idiots (No. 49)," Democratic Underground, January 7, 2002. Todd Wilkinson, "Minority Rule. With Bush, Cheney & Co. in charge, industry has the run of public lands. Everyone else is out in the cold. And you thought this was a democracy," On Earth / National Resources Defense Council, Spring 2002. Paul Koberstein, "Idaho's Sore Thumb: Kempthorne knowingly putting children at risk? Coeur d'Alene Basin children still showing high rates of blood lead poisoning," Cascadia Times, Spring 2002. Timothy Noah, "Dirk Kempthorne, the Dems' Godsend. Bush's awful possible choice to run the EPA," Slate, August 5, 2003. Mike Stark, "Proposed new rules expand wolf killing powers," Billings Gazette, March 4, 2004. News Release: "Kempthorne: 'Federal Legislation Undermines INEEL Cleanup'," State of Idaho, May 14, 2004; also posted by Alliance for Nuclear Accountability. re radioactive waste in Pit 9 at the Idaho National Engineering and Environmental Laboratory. "Kempthorne: N-waste plan wrong. Legislation would let DOE avoid sludge removal, governor says," The Spokesman-Review, May 16, 2004. "Forest Conservation Rule," PBS Online NewsHour, July 13, 2004: "The Bush administration proposed Monday to give governors more control over logging and road building on federal forestlands. The change would override a Clinton-era environmental regulation called the 'roadless' rule." Charles Pope, "Proposal would drop forestland protections. Bush hopes to end ban on roads," Seattle Post-Intelligencer, July 13, 2004. Rupert Cornwall, "Bush Outrages Conservationists with Plans for Logging Boom," Independent (UK) (Common Dreams), July 14, 2004. "2004 Public Eye Editor's Picks," Boise Weekly, September 22, 2004: "Best Use of a Legal Loophole to Collect Some 50 G's in Campaign Cash Before He was Discovered and Had to Close the Loophole: Dirk 'The Accountability Shirk' Kempthorne." Rocky Barker, "Bush erases Clinton's ban on development in forests. New rule gives governors control over roadless areas," The Idaho Statesman, May 6, 2005. "At Least He's Not Your Governor," Colorado Pols Archives, May 16, 2005. Tom Kenworthy, "Natural resources also campaign resources," USA Today, July 24, 2005. Christopher Smith, "Idaho supports plutonium production plan," Associated Press (USA Today), August 30, 2005. "Idaho submits plan to ease wolf protection," Associated Press (Billings Gazette), September 1, 2005. "Defenders of Wildlife Denounces Secretary Norton's Move to Hand Over Wolf Control to Idaho. State Government that Once Voted to Eradicate Wolves to Be Given Control over the Future of this Imperiled Creature," Defenders of Wildlife, January 4, 2006. "Norton, Kempthorne Sign Agreement Turning Over Most Management of Wolves in Idaho to the State," U.S. Department of the Interior, January 5, 2006. John Miller, "Idaho wants to kill more than 50 wolves to help elk," Associated Press (Helena Independent Record (Montana)), January 12, 2006. "Tobacco fund becomes point of contention for Kemphorne, lawmakers," Associated Press (Tobacco.org), January 10, 2006. Press Release: "Stallings: Kempthorne should quit fooling himself," Idaho Democratic Party, January 21, 2006. "Bush Missteps Worrying GOP Governors," Associated Press (CBS News), February 27, 2006. Nicholas Collias, "Dirk Vader Quote of the Week," Boise Weekly, March 1, 2006. Christopher Smith, "Idaho: Feds try to back out of cleanup pact," Associated Press (Casper Star-Tribune (Wyoming)), March 1, 2006. "Record Amounts of Transuranic Waste Leaving Idaho," U.S. Department of Energy, March 3, 2006. Shea Andersen, "Down in the Dirk. 2005's veto-machine is 2006's lone wolf," Boise Weekly, March 15, 2006. "After Norton, let's break the cycle," Missoulian.com, March 16, 2006. "Bush nominates Idaho governor to Interior post," Associated Press (Houston Chronicle), March 16, 2006. "UPDATE 2-Bush picks Idaho's Kempthorne for Interior," Reuters, March 16, 2006. "Bush names Idaho gov. Interior Secretary," UPI (Monsters and Critics), March 17, 2006. Editorial: "No redesign at Interior," Los Angeles Times, March 17, 2006. Robert Gehrke, "Bush taps Idaho guv to hot seat at Interior. Problem solver: Critics disagree, say Kempthorne is 'Gale Norton in pants'," Salt Lake Tribune, March 17, 2006. Michael Janofsky, "Idaho Governor Selected to Lead Interior Dept.," New York Times, March 17, 2006. Gary Stivers, "Pros and cons mount on Kempthorne nomination," SunValleyOnline.com, April 20, 2006. Editorial: "Dubious Choices," New York Times, April 24, 2006. This page was last edited on 26 June 2017, at 16:40.